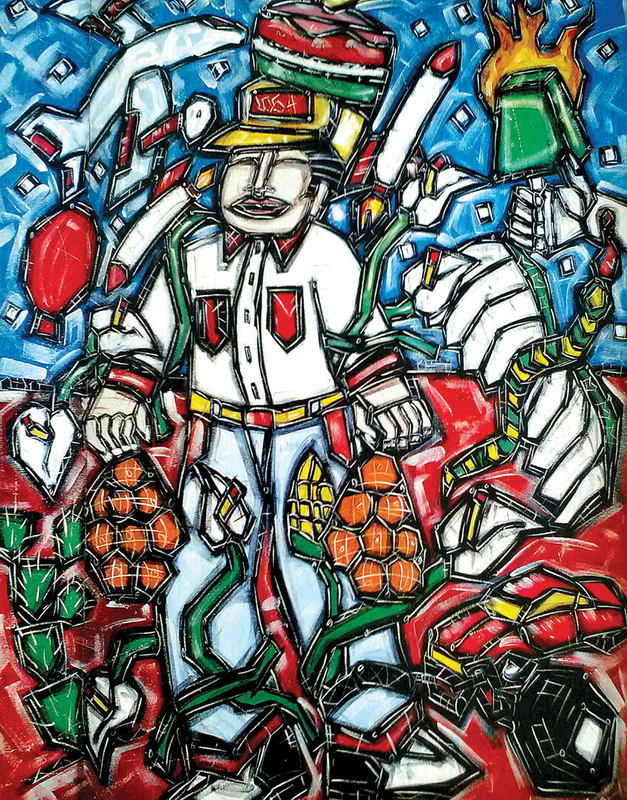 Freeway Man and His Sacks, Mixed Media, 6' x 6,' collection of Cheech Marin. 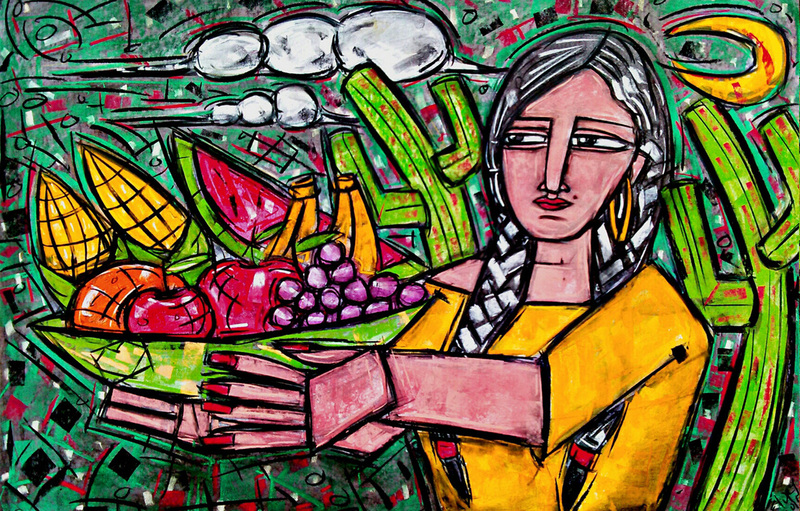 David Flury is a Chicano artist. He will say so himself. He won’t say much about the early years he spent attached to a life on the streets of South Central. He will only acknowledge that it was based on loyalty to others. And it was what he did to survive during a time when he and his contemporaries felt compelled to prove they were beyond hope, beyond fear and capable of conducting themselves with no remorse. It is not something he cares to uphold as virtuous or worthwhile. He could have, like many of those he grew up with, been a less than memorable casualty or a permanent resident in one of the state’s penal institutions. His father, he says, was from the deep South and white. “But my mother was from Guatemala,” he shares in a comfortable office at the Goodwill Industries complex in Lincoln Heights where he has worked part-time for some 14 years. The trajectory of his life is etched on his face, where the years have deposited subtle evidence of wisdom earned the hard way. In his early 40s, he is tall despite his maternal ancestry. The Mayans from whom his mother descended remain, however, forever part of the legacy he fuses for his strong sense of both artistic and cultural identity. He knew from the time he began to speak and walk that he wanted to be an artist. “I was always drawing. It was just something I couldn’t help,” Flury recalls. But that “life,” as he euphemistically refers to the association with a a neighborhood clique he won’t dignify by naming, was for a time as strong a calling as the need to make art. Fortunately, he met a woman. It was so long ago, he shrugs, he can’t recall her name. But she introduced him to actor Danny de la Paz (Boulevard Nights, American Me). Through de la Paz, he met Chicana artist Margaret García. “I started working for her, helping her out,” Flury continues. “I wasn’t getting paid, but it was worth it to me because I was learning.” García introduced him to Frank Romero, a member of Los Four, the pioneering Chicano art collective that included Magú, Carlos Almaráz and Roberto de la Rocha. “Frank really took a chance on me,” he says of the artist who came to be a serious contender for a father figure. Through those first years as a protégé of Los Four and an apprentice who logged thousands of hours in Romero’s studio doing whatever needed to be done, Flury was learning. “Frank never tried to teach me or give me lessons,” says Flury, who works from his own studio in Lincoln Heights now. An art instructor at the non-profit Plaza de la Raza, he has also quietly become one of the most sought after Chicano artists on the West Coast, a fact he only fesses up to when prodded. “I think there are too many artists who are part of that whole diva thing. And I just don’t care too much for that scene,” he admits. He is content with his work as a prolific artist and his job in security and loss prevention at Goodwill, where he now also helps run an in-house art program for the local staff with special needs at the heart of the nearly 100-year-old world-wide organization. A small gallery store inside the multi-story headquarters on San Fernando Rd. next door to the familiar Goodwill Store has even been established to showcase the work made by those employees he teaches with a patience and an empathy you might not expect from someone with a similar past. 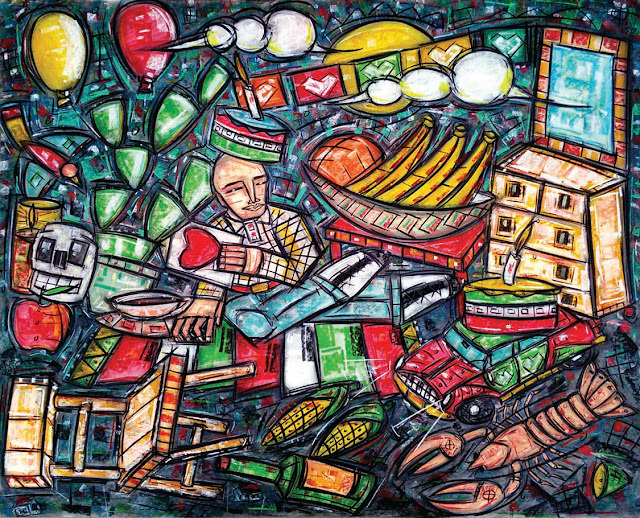 “Even though I pretty much stick to myself, as far as the L.A. Chicano art scene is concerned,” he explains, “I’m down for the ones coming after us, because they’re the ones who matter.” Because García, Romero and others took genuine interest in him, he says, he was able to transcend the limits his youthful choices had created around him. And he feels it is only right that he try to honor that by stepping into a similar role as an art instructor. The cover of our current print edition, issue, in fact, is a 6 ft. by 6 ft. painting that has been in the collection of Cheech Marin for years. The imagery is at once playful and moving, electrified by shapes and colors shifted dimensionally yet still informed by a resolute Chicano aesthetic. Shadow and light are braided into strands of energy that also intermingle with nature and life. Our cover in honor of street vendors and the recently passed city ordinance that will legalize paleteros and eloteros and taqueras and fruteras is called Freeway Man and His Sacks. It is not only an allegory for the fruit vendor waiting at the bottom of the exit ramp but a symbol of Chicano art at its evolutionary best. Flury, unsurprisingly, has been exhibited on the East coast and has representation at a handful of galleries there. His work began making its way into the hands of private collectors across the country even before he had finished serving time in a correctional institution. He doesn’t say when exactly but implies that he caught that last and final case after he had already begun his unofficial internship with the seminal group of artists widely regarded as the original Chicano Art dream team. Find Flury on Facebook and Instagram. Let him know you saw his work. And consider taking his class, held early in the evening on Fridays. Students sometimes bring snacks and drinks for a small informal gathering in his private studio at the end of the session. “First, I make them work, then I let them relax and unwind. You’ll have to come over and check it out sometime,” he concludes. Here, we offer some of our favorite Flury images in homage to both mothers and hard-working vendedores ambulates, often just moms working 10-hour days to provide for their own families. We hope you enjoy them as much as we do.